Little Common Football Club’s attacking players invariably grab the headlines, but on Tuesday night the defenders also proved their worth. Common stood firm in the face of fairly constant pressure during the second half before scoring late on to clinch a 3-1 victory at home to AFC Uckfield Town in the Parafix Sussex Senior Challenge Cup. 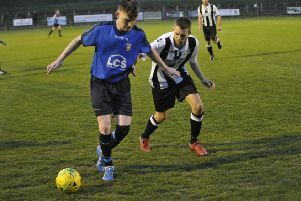 Little Common midfielder Harry Saville keeps a close eye on an AFC Uckfield Town opponent. “We put our bodies on the line and it was a resolute performance in the second half,” said Common player-manager Russell Eldridge. “The boys defended well. I thought Cruiky (Dan Cruikshank) was excellent tonight and Matt (Cruttwell) made up for his error in the first half with some fantastic saves in the second half. “That’s probably what we’ve got to do a little bit better on a more consistent basis, being a bit more resolute and building from the back. “It was an excellent win and more importantly to bounce back after the dropped points at the weekend (when Common drew 3-3 at home to Mile Oak in the league. Adam Smith skips between two AFC Uckfield Town opponents. Cup commitments will be put to one side for the rest of the month and Common will focus solely on picking up points in Macron Store Southern Combination Football League Division One. They’re fifth in the table at present - only three points outside the top three - heading into a home game against bottom club Ringmer tomorrow (Saturday). Kick-off is 3pm. Common could be without four defenders. Dave Ammoun has joined Jake Sherwood and Anthony Cooper on the injured list, and Cruikshank is away. Luke Curteis and Dom Bristow should return, however. Little Common celebrate their opening goal in Tuesday night's 3-1 victory.